It all began several years ago when we upgraded our master bathroom and closets. 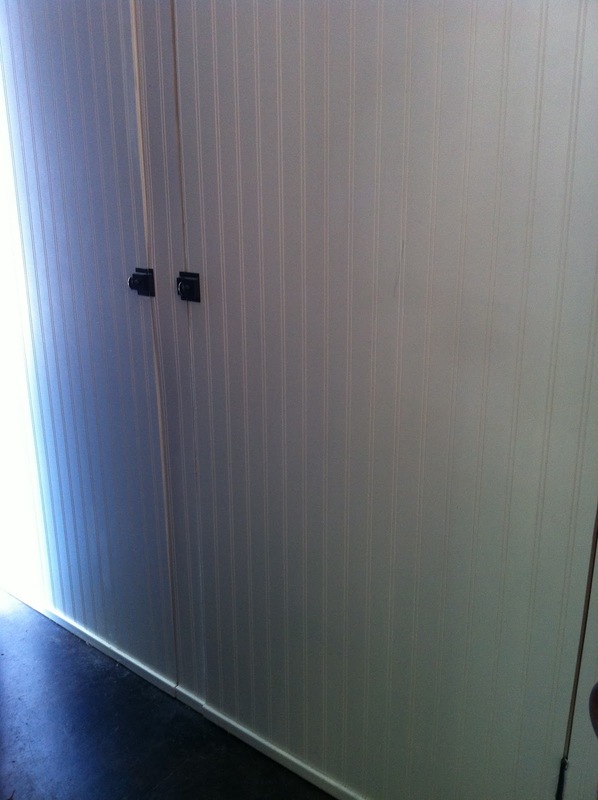 We have 2 standard size closets, although mine is a bit larger, that originally had bi-fold doors. They were always stuffed and messy and we could never view the closet as a whole. We got rid of the doors, raised the height of the closets and papered the entire room in raffia wallpaper including the closets. We added marble flooring throughout. 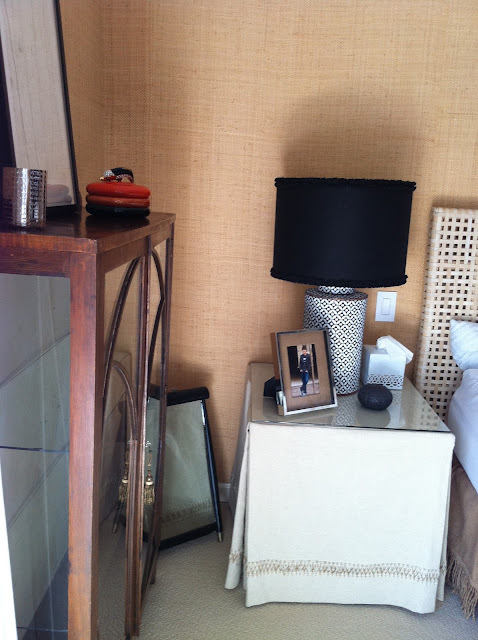 We installed low voltage lighting throughout the space including inside the closets. We replaced the doors with large nickel rods from William Sonoma Home and custom made curtains. Now, whenever I pull them open I feel like I'm shopping in a boutique when I'm getting dressed. 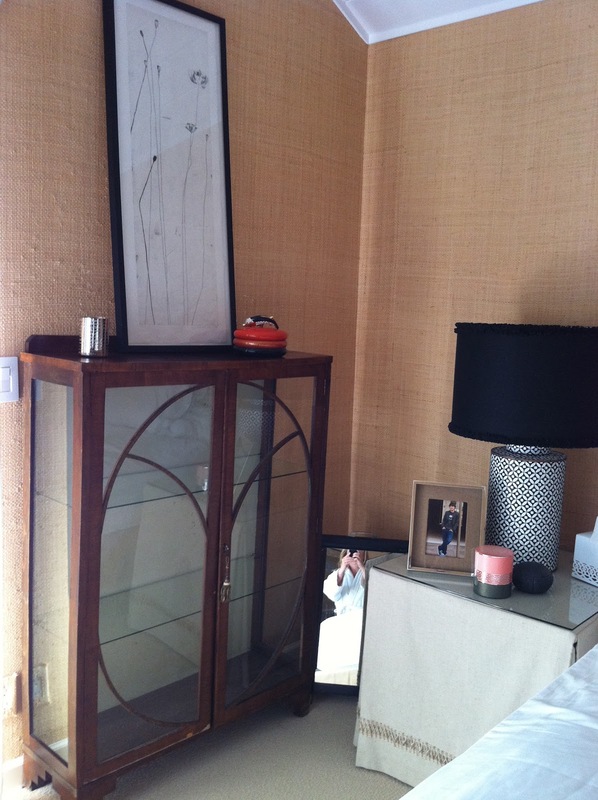 I found the perfect entertainment center at Home Goods that I re-purposed into my closet system. I removed the doors, tucked it up and under the header and added a pair of closet rods to each side of the unit to double the hanging space. 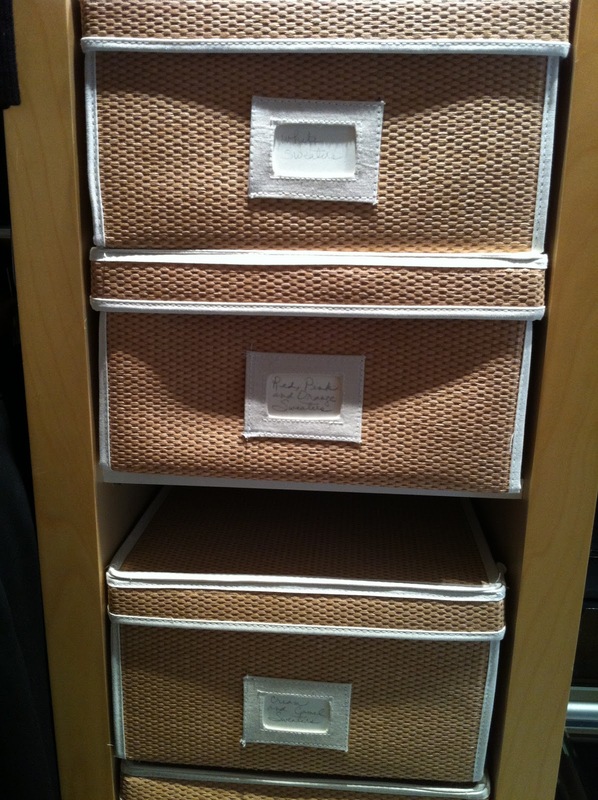 I found individual storage boxes at the Container Store to hold all my sweaters, etc. 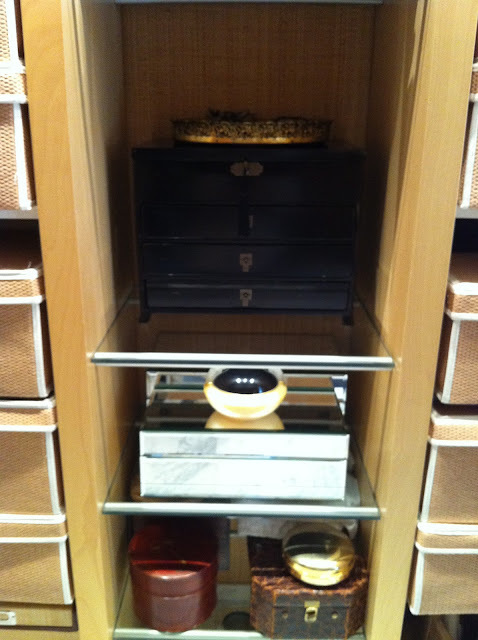 The middle section has glass shelves where I display my handbags and jewelry. 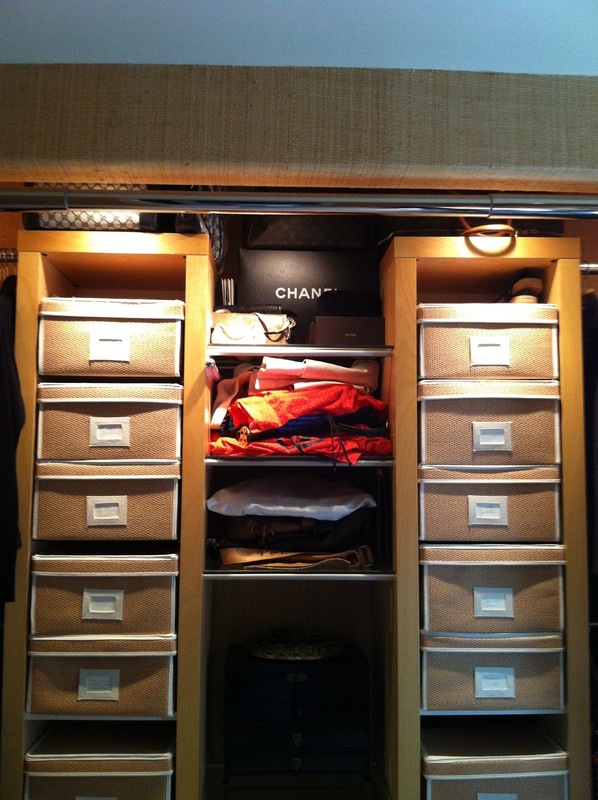 It has been the perfect closet in every way except of course when it comes to SHOES! My husband's closet on the other hand was easy. We found his closet system at IKEA in a finish that matched mine. 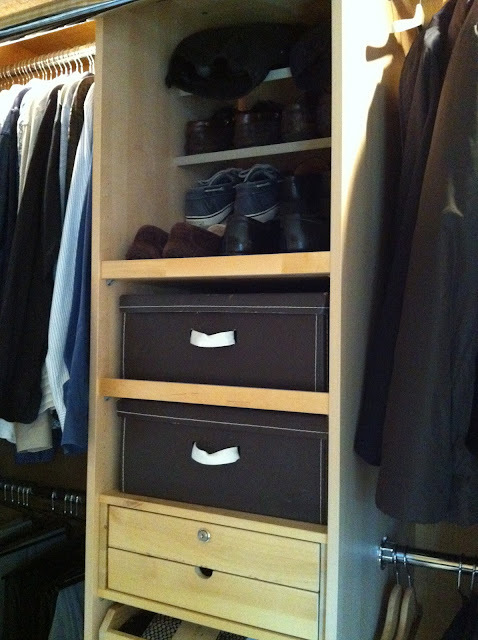 We added a pair of rods to both sides and Voila... a closet that has met his needs, including his shoes, perfectly! You are probably wondering what I've done with my shoes... well, that has not been so successful. 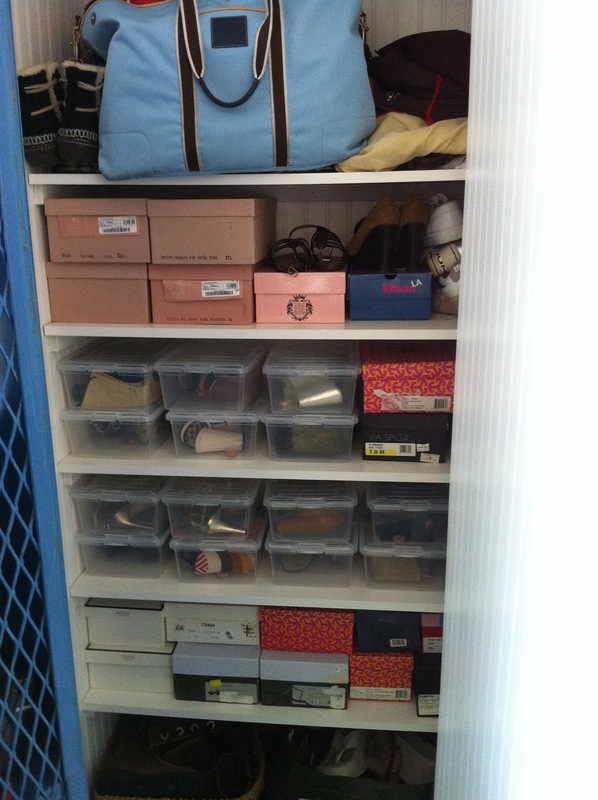 At first it was OK because we had remodeled our garage and added built in closets, one specifically for my shoes. This actually worked out fine for a while... and then one day while out treasure hunting I came across this cool vintage blue metal locker and lugged it home. It landed smack in front of my garage shoe closet and has been there ever since. 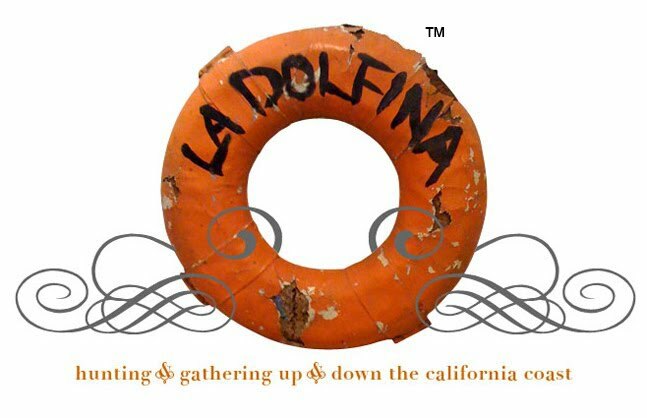 It has served beautifully to corral everyday shoes, coats, hats, sporting goods etc. 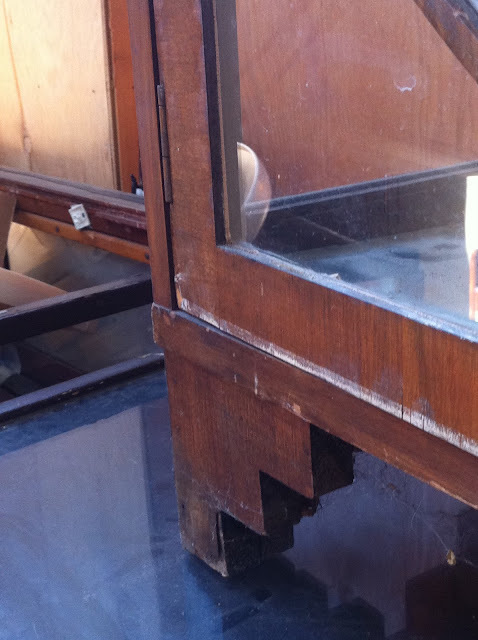 and kept our carpet relatively unsoiled. But... I've been wearing the same couple pairs of shoes over and over and haven't seen or worn the rest of them except for the occasional trip out to the garage when my poor husband has to move the locker out so I can squeeze in behind it and grab a different pair, usually for a special occasion. To tell you the truth, I've forgotten how many beautiful shoes I have. Out of sight, out of mind. Well, that's all changed now, because I found a beautiful new solution! It's not my idea though... and I wish I could remember where I saw it, but someone had taken an antique glass cabinet/bookcase and used it to showcase their collection of shoes and it looked amazing! 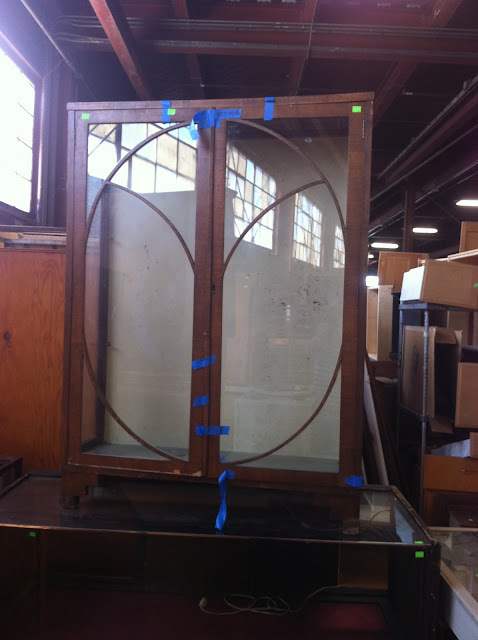 Well, last week, I found a similar piece. Although it was a little beat up, the price was right at $50 and the dimensions are perfect for the space I'm planning to put it. Originally I had planned on lacquering it black but once I got it home and cleaned it up I love how the natural wood warms up the room! 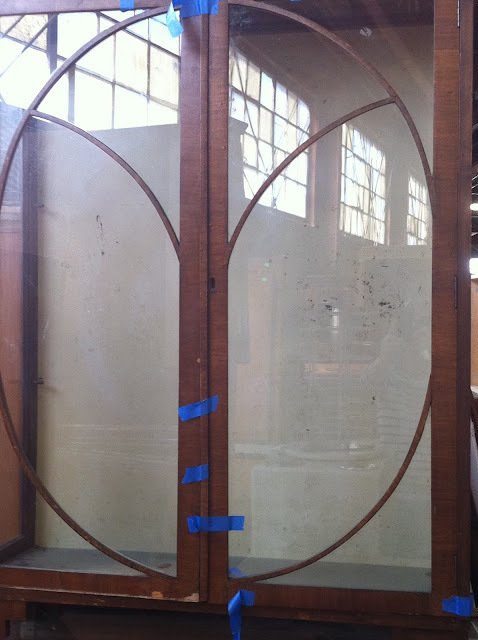 As you can see there is a dirty white back that needs to be either painted or papered. I'm definitely going to paper it. I'm considering a fun and dramatic vintage wallpaper and have looked on ebay and found several that I like. I'm also considering, on the advice of a friend, papering it with some of the left over raffia wallpaper that is currently on my walls. I'm leaning towards the raffia as I think the shoes will be interesting enough on their own. 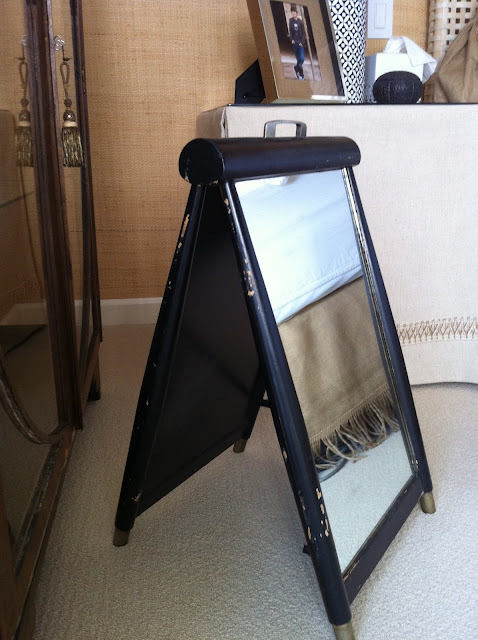 I even found a vintage mirror from an old shoe store for $10 at The Alameda Pointe last weekend which I tucked into the corner for a little extra sparkle! So, what do you all think of my new shoe wardrobe? Would you ever consider storing your shoes in a bookcase like this? One last thing I just had to share. My first pair of Chanel Shoes! 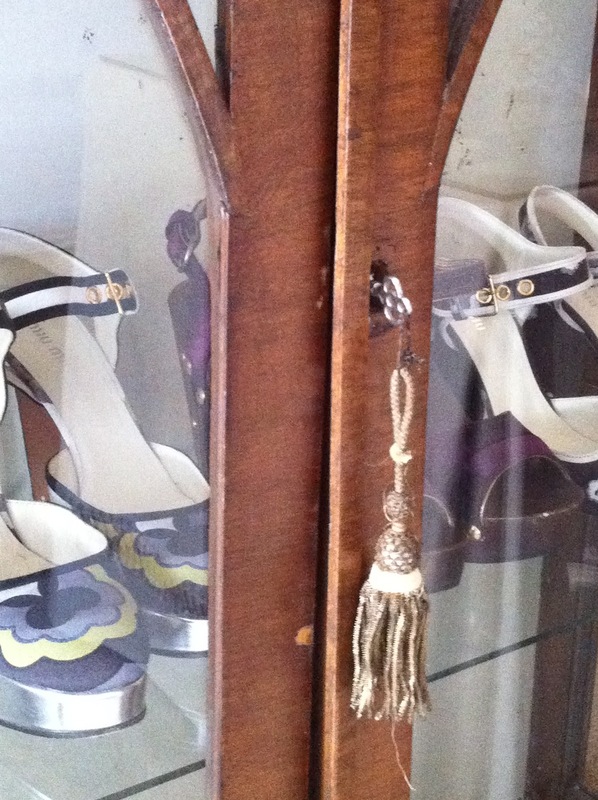 Ok I am SO jealous of both the shoe cabinet and the GORGEOUS shoes!!!! Such a great idea! love that idea, t. it's gonna be a beaut! Oh, and I featured your little red pig in my treasury at Etsy "Snow White & Rose Red" Have a good rest of your weekend. 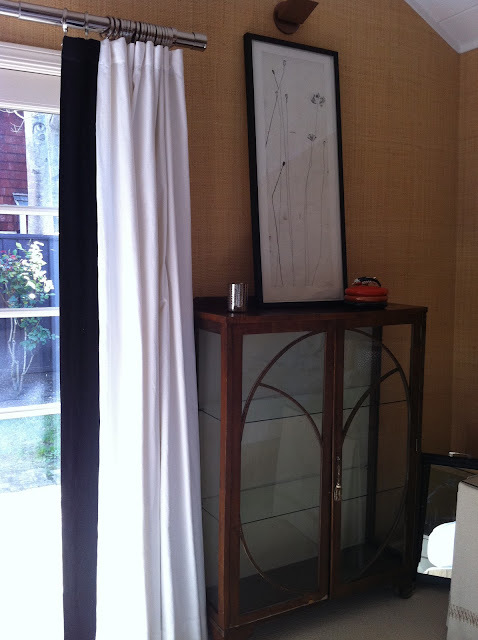 Love that you wallpapered inside your closet, as you know I'm a huge fan of doing so! Love your organization, it makes me smile. I'm especially loving the new cabinet you scored. 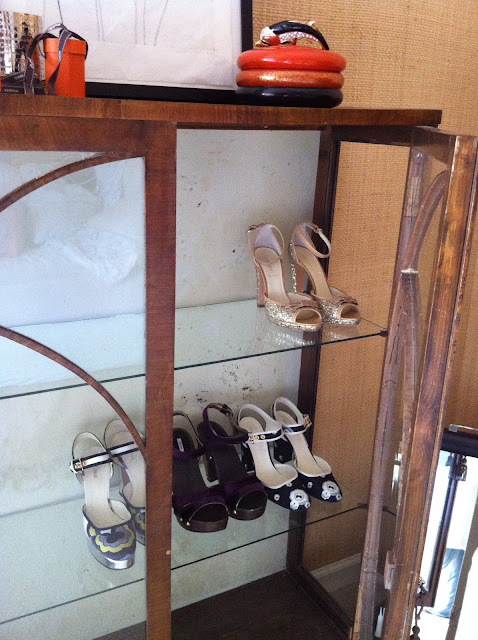 I am shoe nut and have been wanting to display my shoes in a fab cabinet for such a long time, but I have yet to get around to finding the perfect piece (well, I haven't actually been looking!) I vote wallpaper the inside with a dramatic and fabulous wallcovering, make a stunning statement between the wallcovering and your amazing shoes! $50.00...that's amazing!! Love how pretty the shoes look displayed, and the cabinet looks great just the way it is. Hope you're having a wonderful weekend! Wow what a great post!! I love it....love love love your closet, somehow it reminds me of a sleek interior of a yacht, quite gorgeous with all those nicely organized pretty containers. And your newly revamped shoe "etagere" is fabulous...what better way to showcase and enjoy your shoes even when you are not wearing them? I love it! I am like you in that I also hav forgotten how many pretty shoes I own..so many are pushed back and in hiding..its so nice to see them and cherish them. 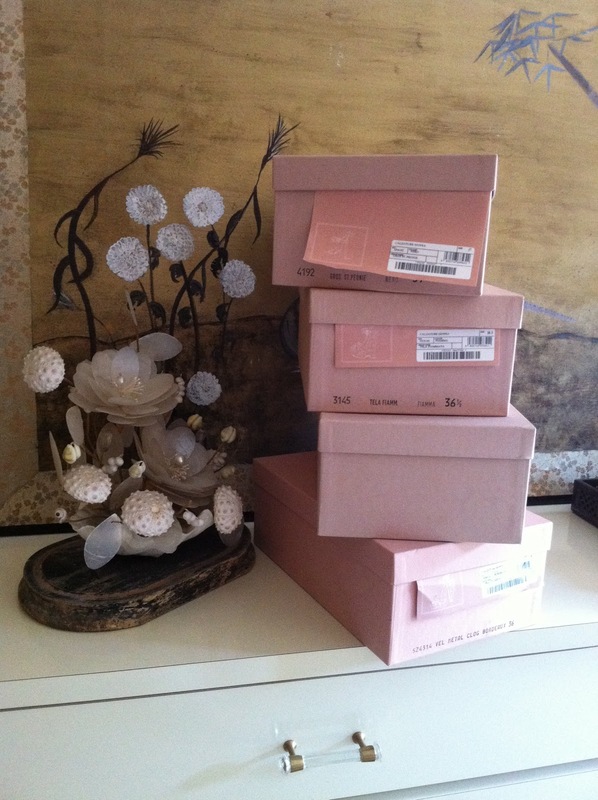 I mean we are talking shoes here, girls best friend! Thanks for sharing your beautiful post with us. 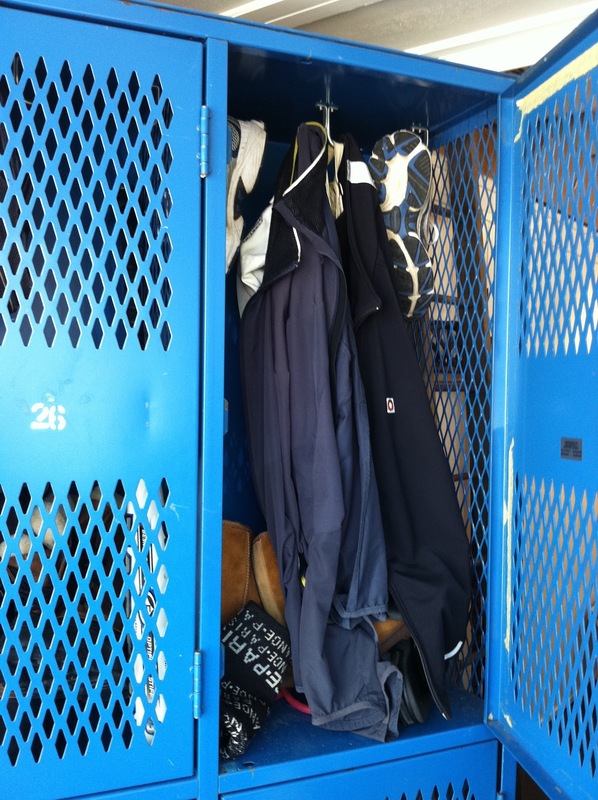 First, I love the blue locker and hope that you have kept it. The idea of storing your shoes in the display cabinet is wonderful. We have one of those...somewhere and well, my shoes, which I shall not discuss the number aren't as fun as yours. 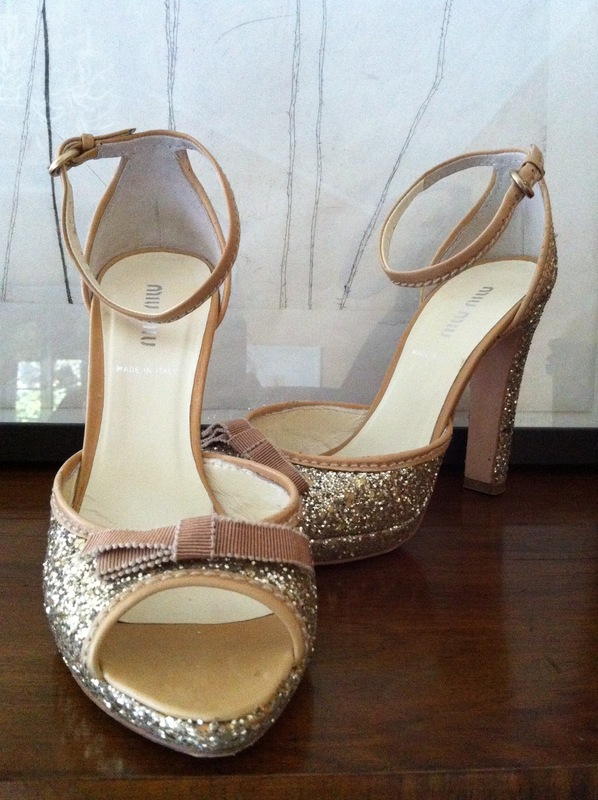 Love the first pair with the sparkle. What a fabulous idea! I might have to borrow it! 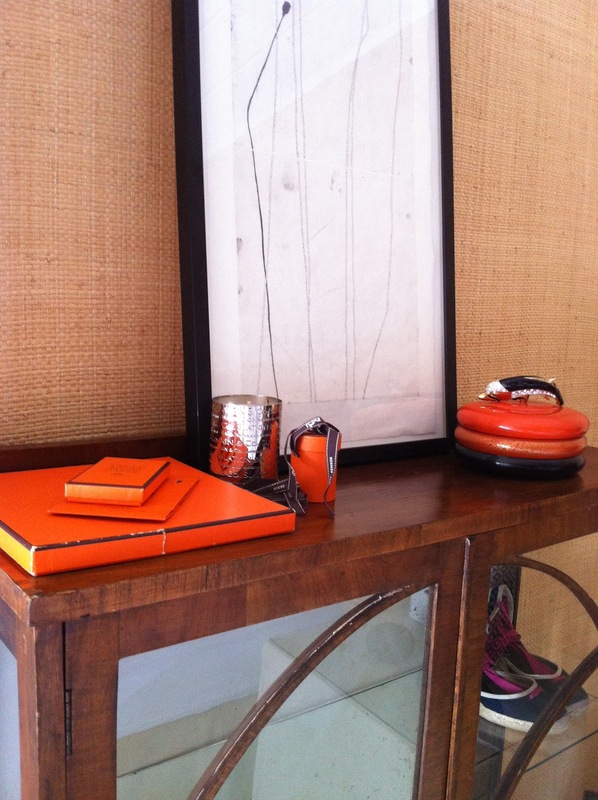 Bravo Terri ~ fabulous idea, gorgeous cabinet and fabulous score with the Chanel shoes. I love your raffia bedroom wall & think lining the back of your new cabinet would look great. Must say huge fan of the blue old locker too! I am really impressed with your closets! I have thought of doing a nice curtain for my daughter's closet as the sliding door keeps coming off the track. And I didn't know WS had a home store...Yay!! Your shoe cabinet is just awesome. And the mirror on the floor is perfect for looking at them on. You really thought out of the box on this one! I only hate you because I am so completely jealous about everything in this post!!! 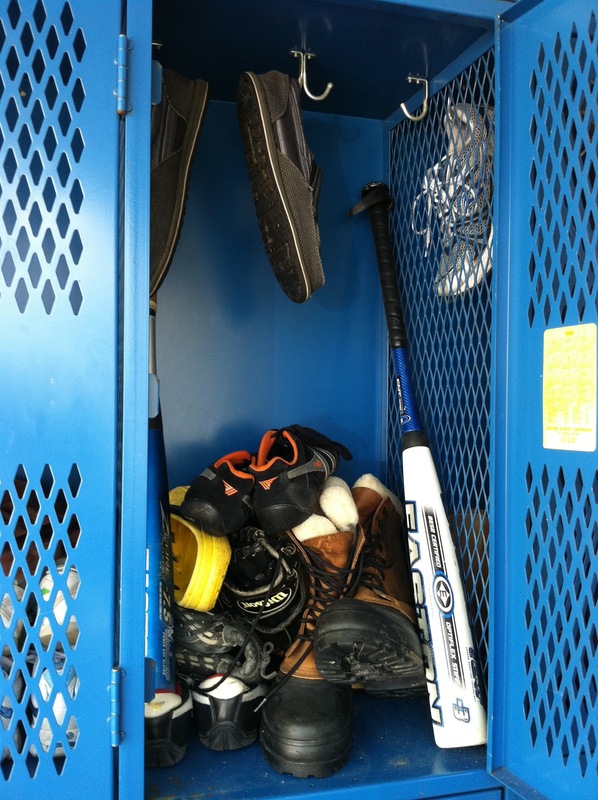 Your closet, your blue locker, your antique cabinet, and YOUR SHOES!!! such an awesome idea!!! I agree the raffia paper is the best option. I wish I had some space for something like that. 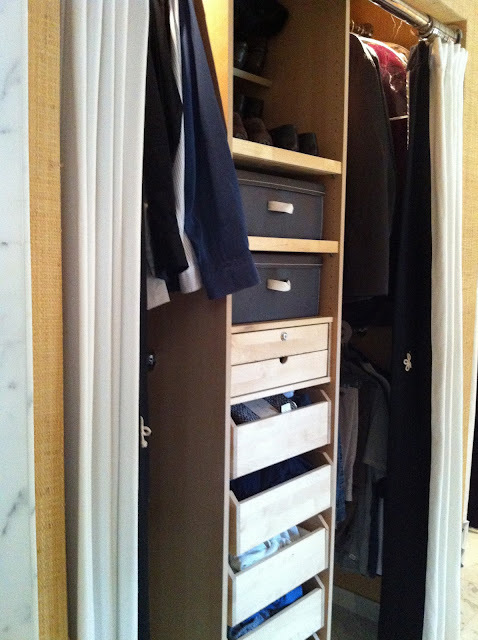 My sweet friend, you have done an amazing job of designing your closets. Perfection! 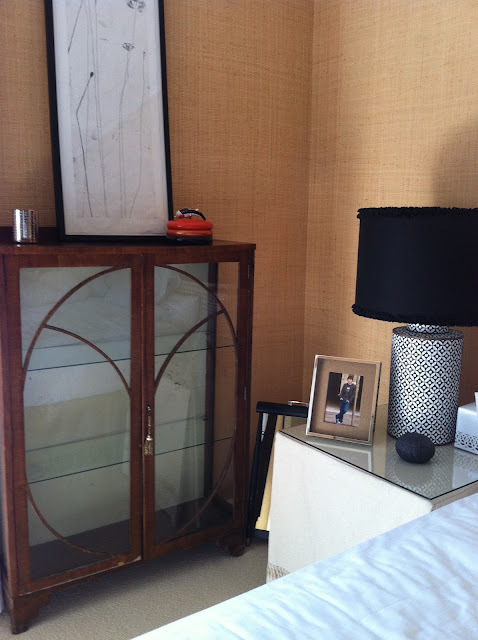 I also love the shoe cabinet...it will serve a wonderful purpose and be a beautiful dispay as well. 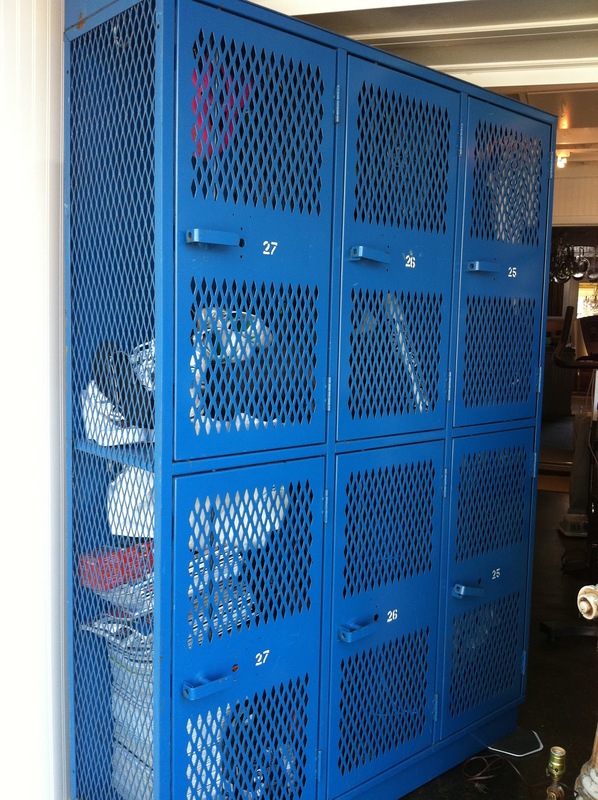 I also think your lockers are very cool. I love the blue color. You absolutely amaze me with your wonderful design concepts. Love it, my talented friend! 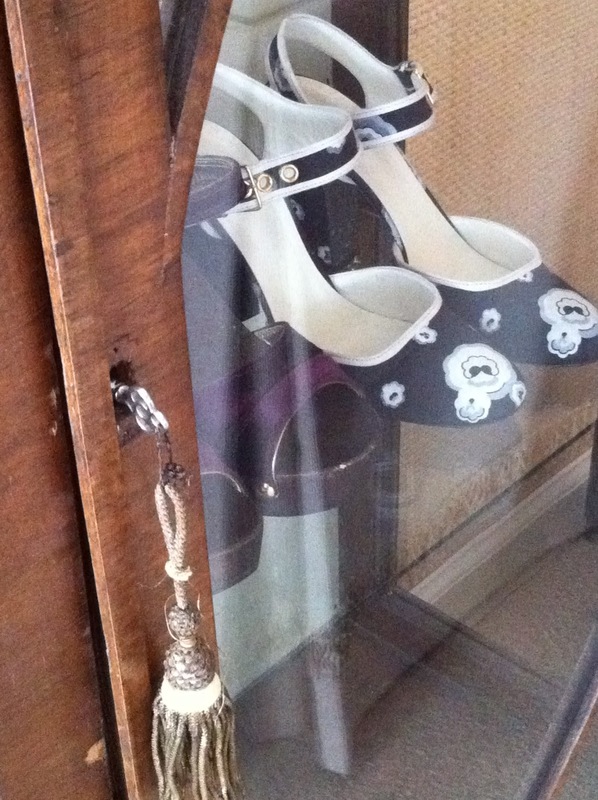 Oh, and the Chanel shoes...a thing of BEAUTY! What a fantastic idea! I will share. I have my shoes in an old metal document file. It has 30 drawers = 30 or more pairs of shoes. 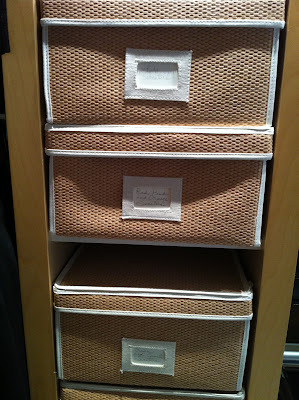 Each drawer is 12x9x3, and had a little card holder on it. I really love this idea...you can enjoy your pretty shoes as your falling asleep and waking up. 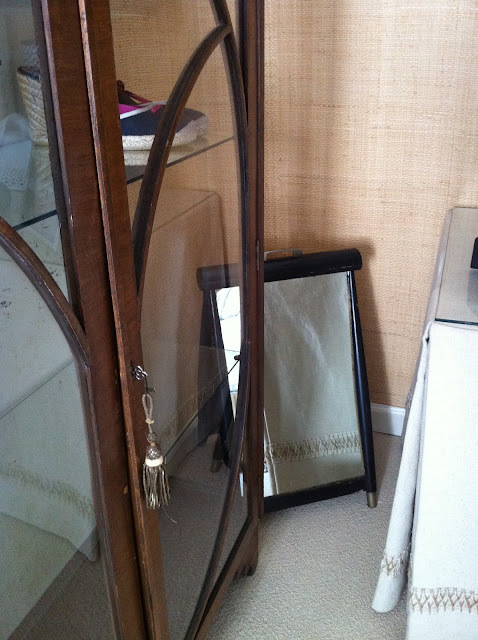 I love that in your room and yes use the left over raffia for the back of it! You have a gorgeous selection of shoes my dear. Oh and I love that mirror. I so wish you and my sister would spend a day shopping. You would have so much fun together. Those channels are amazing! 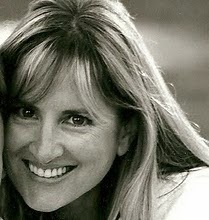 Impeccable taste Terri! I love how beautiful you keep your shoes. I would wear those CHANELS to shreds! I really love the glass cabinet idea for displaying your shoes like prized possessions. 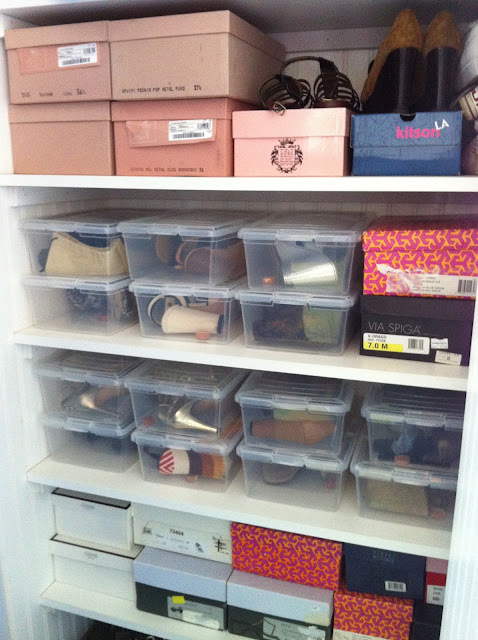 You've also given me an idea of using more boxes in my closet to utilize the space. Thanks! P.S. I'd probably go with one of the two papers in the middle. They are gorgeous as well, and will stand behind and compliment any kind of pattern in anyone of your shoes.